Along with news on DLC, additional fighters, Spirits, Adventure Mode, and amiibo, Nintendo also provided more information regarding online features, matchmaking, and announced the Smash World mobile service for Super Smash Bros. Ultimate today. One of the more interesting bits was just teased instead of outright detailed: the single-player Adventure Mode. Similar to Adventure Mode: Subspace Emissary from Super Smash Bros. Brawl, Adventure Mode: World of Light is a single-player mode which will tell the story of why numerous video game characters in the game have transformed into spirits. A trailer for World of Light can be watched below. While today’s Nintendo Direct video provided some sneak peeks into the mode, director Masahiro Sakurai wanted to keep this part secret until the game’s release in December. Super Smash Bros. Ultimate players will be able to chat with others in battle arenas using the Nintendo Switch Online app, but there’s another feature in the works. 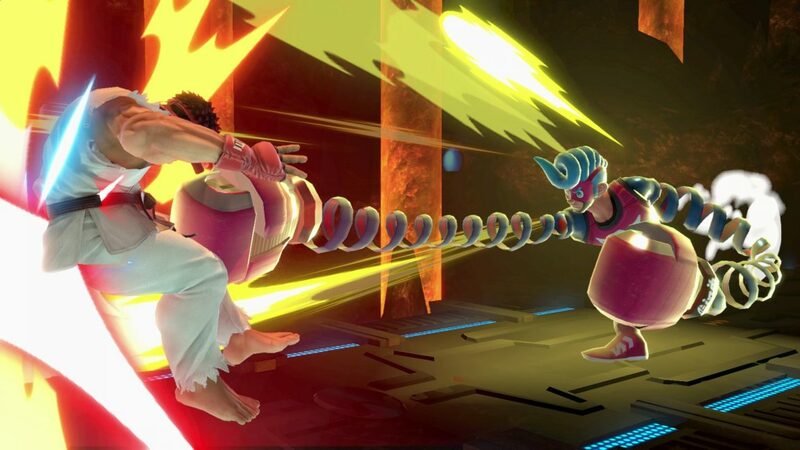 Called Smash World, this new smartphone feature will allow players to post and watch videos. It has all sorts of other “fun features” as well, but those will be revealed at a later date. Additional information provided today on assist trophies, Mii Fighters, wireless and online play, and matchmaking can be found below in an organized fashion below, courtesy of Nintendo. In Super Smash Bros. Ultimate, assist trophies do exactly what their name suggests – they assist players in battle. Each is based on a video game character and unleashes a variety of different powers, both offensive and defensive. The total number of assist trophies in the game is 59, representing characters like Guile from the Street Fighter series, Isaac from the Golden Sun RPGs, the Fly Swatter from Mario Paint and Spring Man from ARMS. Super Smash Bros. Ultimate lets players battle together with friends and family members via local wireless or online. For Fun and For Glory, which existed in Super Smash Bros. for Wii U and Super Smash Bros. for Nintendo 3DS, are no longer options. Instead, matchmaking is based on three factors: Preferred Rules, which lets players choose their rules for battle and pair up with others with similar preferences, Global Smash Power, an online leaderboard that pits players against others with a similar score, and Proximity, players who are close to each other geographically. Two fighters are better than one.When playing Super Smash Bros. Ultimate online, two players can team up on one Nintendo Switch system online and take on other teams with the same setup. Once a player’s Global Smash Power is high enough, she or he will be invited to compete in elite in-game battles. These VIP matches are for the best of the best and offer some serious competition. Everyone who competes online will need to create a unique Smash Tag. By beating a fellow fighter, players will receive their Smash Tag to display on their profile. Collecting a bunch of Smash Tags is a great way to show off high-level Super Smash Bros. Ultimate accomplishments. Players can select pre-determined short messages, assign them to the control pad and send them to other players before and after battles. The game offers a wide selection of varied preset messages. As in previous games, players can watch other players battle in Spectator Mode. Analyzing the battles of other players can be helpful in learning new strategies and techniques. Players can play other modes while they search for an online battle. Not every mode will be available while waiting, but it’s a great way for players to keep occupied between online battles. Players can create custom battle arenas when playing online that allow them to compete against other players in a more intimate setting. In a battle arena, there are options to join a battle, wait in line or spectate. Fans in North America can check the game’s site for information about a variety of upcoming hands-on events. At these special events, players will have the chance to choose from all 74 fighters. If you missed today’s Nintendo Direct, there’s a recap through that link, and you can find out more on the new characters, amiibo, spirits and DLC through a previous post. Super Smash Bros. Ultimate releases December 7 for Switch.